Mom and Dad owned a Spudnut Shop when I was a little girl and I can still see my parents wielding their 8 pound 2-foot rolling pin over their daily batches of Spudnut dough. I inherited this green-handled treasure. I’ve been a rolling pin lover ever since. They come in all sizes and shapes now. Tapered pin (often made of maple), straight pin (usually made of ash or walnut), heavy big guys with ball bearings in the handles (like my mom and dad’s), and skinny jobs that aren’t much more than a thick dowel. 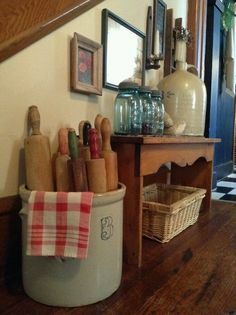 Rolling pin collectors often cluster them into a large crock for display. 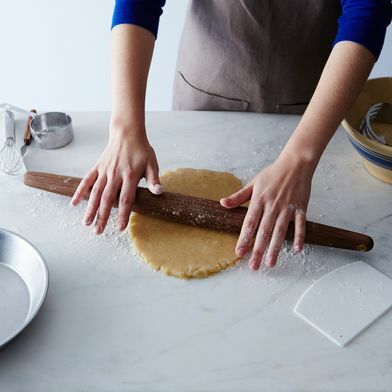 Rolling pin aficionados will tell you rolling dough with a pin can be a surprisingly hard thing to learn if you’re a new cook. Part of the problem might be that many pins sold for home use tend to be heavier than needed, so they’re difficult to maneuver. And the pros usually caution that the tapered pin isn’t the one you want to choose if you’re just starting out using a rolling pin. 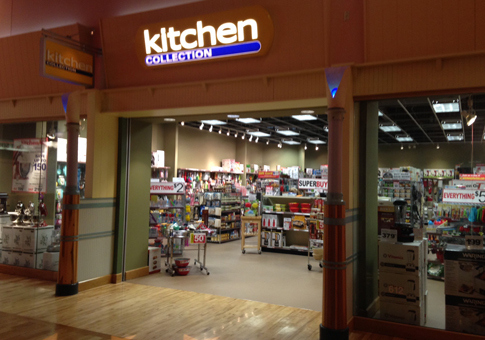 First, do you homework—scrutinize and handle the pins in your kitchen specialty shops, just so you know what you’re looking for. Then scout out your thrift shops. 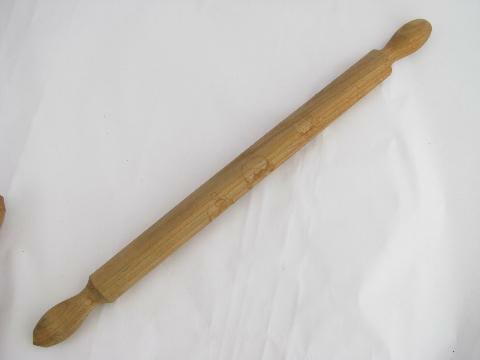 Top quality rolling pins often show up there. Second, shop at your home improvement or hardware store if you’d like to give a skinny pin a try. 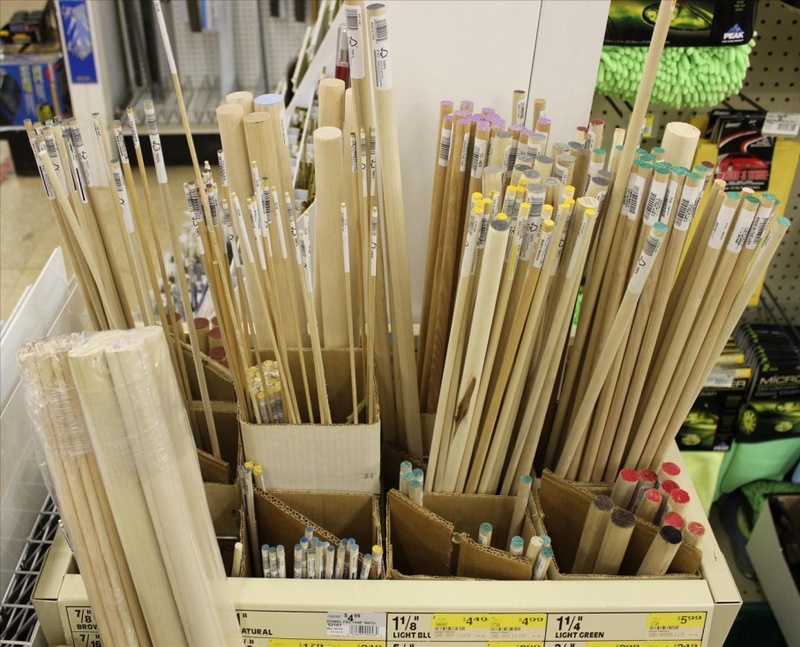 Here’s where you’ll find 7/8-inch diameter dowels, 13 inches in length, and for not much money. 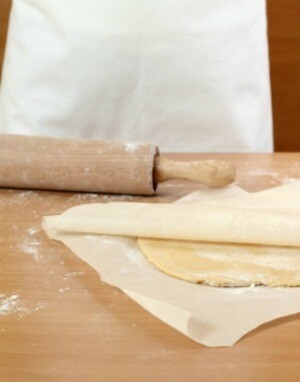 For rolling out any kind of dough, use a clean or new tube sock on your rolling pin and flour it. Also get heavy duty cotton duck cloth to roll out on, flour this as well. Some cloths come with dimension markings, as this photo shows. When rolling out the dough onto a pan (such as for pizza), take a good size piece of plastic wrap and spray it lightly with cooking spray. With the sprayed side down, place on top of the dough. Gently roll the dough to the edges of your pan. The plastic wrap allows you to roll it without it sticking to your rolling pin. Similar idea for making pastry: flour the work surface then cover the pastry to be rolled with plastic wrap, and roll out as usual. 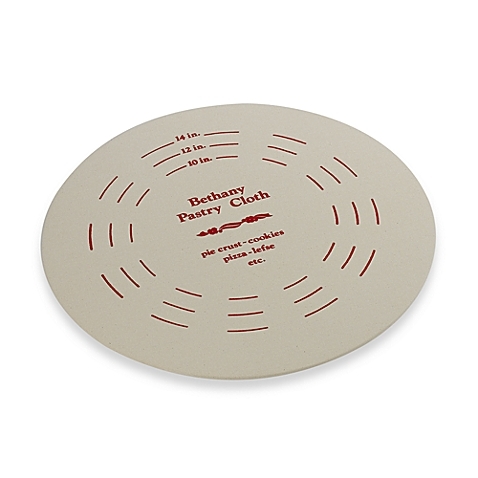 This eliminates the need to flour your pin. I’ll close with more of Medrich’s advice: “If you are already good at rolling dough and love your rolling pin, don’t change a thing. 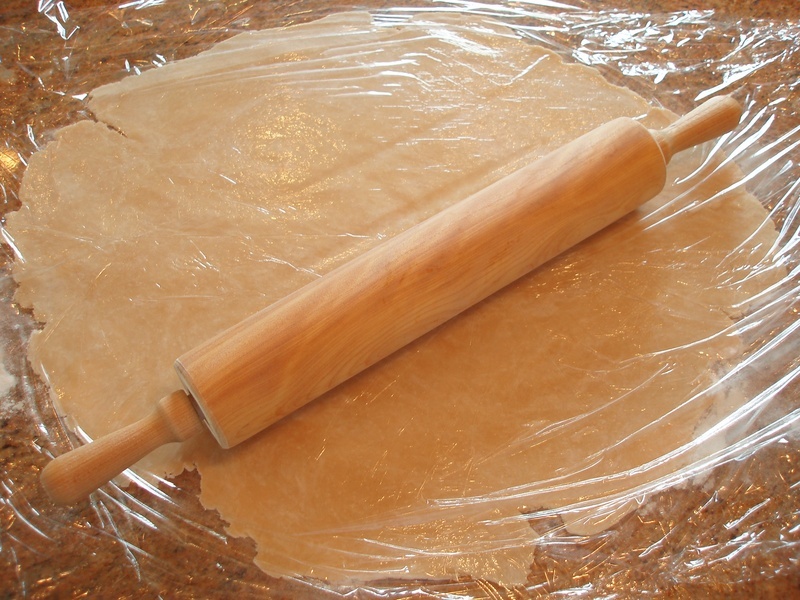 If you’re new at baking or just have trouble rolling dough, look to your rolling pin. Is it tapered? Try a straight pin. Is it heavy? Try a lighter one.” The bottom line, though, is do spend the time perfecting rolling pin use. It’s a useful, important kitchen tool. You just want to get clear on your rolling pin style and go for it!